Set in 1936, this film is a comment on the corrupt politics of Stalinist Russia, and won the Best Foreign Language Film Academy Award. Set in 1936, this film is a comment on the corrupt politics of Stalinist Russia, and won the Best Foreign Language Film Academy Award. A military hero of the Bolshevik Revolution, Colonel Kotov - living an idyllic life with his young wife and daughter - finds his lifestyle in threat when a mysterious man from his wife's past returns after a ten year gap. He works his way into the rest of the family's favour using his undoubted charms, but Kotov realises the truth and the sinister game this man is playing. 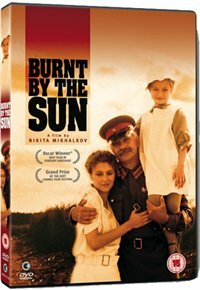 A military hero of the Bolshevik Revolution, Colonel Kotov - living an idyllic life with his young wife and daughter - finds his lifestyle in threat when a mysterious man from his wife's past returns after a ten year gap. He works his way into the rest of the family's favour using his undoubted charms, but Kotov realises the truth and the sinister game this man is playing.